All products listed and sold via this website are copyrighted to ©Windmill Books Ltd. The purchase and sale of ebooks via the German War Machine is formed once you have made an order. Once your order has been accepted, and payment has been confirmed by Paypal, our electronic system is unable to prevent items being dispatched to you. Ebooks are supplied in both MOBI and EPUB formats. It is the responsibility of the purchaser to obtain a copy of the appropriate software necessary to view the ebook. We recommend the Kindle app for all MOBI files (you can download for free at http://www.amazon.co.uk) and the iBooks app for all EPUB files (you can download for free at http://www.apple.com/uk/ibooks). Once you have purchased your ebooks, you can download each title up to three times. Please do not make illegal copies of your ebook files as this is considered a breach of copyright. Refunds and exchanges will not be given for electronic goods. If the file you have purchased does not show up in the ‘Downloads’ section of your account, please notify us at orders@germanwarmachine.com with your order no. in the subject line. We will send you a new copy to download within 24 hours. All ebook files supplied by German War Machine are safe for download and do not carry any virus or malware, which could damage, harm, or render inoperable your ereader/computer. However, all ebooks are purchased at your risk. The German War Machine reserves the right to use any photos or information you submit to the website. You must not submit any material to the website that is indecent, obscene, defamatory, threatening, abusive, racist, blasphemous or offensive. Any material that you submit must not infringe any intellectual property rights (i.e copyright and trade marks). You must own the rights to anything you wish to submit, or obtain permission from the rights owner before submission, and notify us where credit is due. 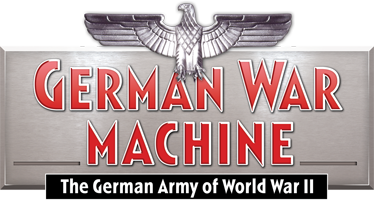 All comments, reviews, and caption submissions are moderated before being published on the German War Machine. We accept all constructive feedback. However, we reserve the right to delete any comments that contain profanity, and do not comply to the terms as stated above. In order to purchase our ebooks, you must register your details with us. We ask that you provide us with accurate information and fill out all mandatory fields (marked with a red asterisk). You will be asked to login using the e-mail address you have provided and a password you have chosen. Please keep your account details safe as you are responsible for updating any personal information you have given to us, including passwords and e-mail addresses. German War Machine does not have access to your account information; this is kept in a database with restricted access. Only one registration per person is allowed. We reserve the right to cancel and terminate your membership at any time if any of our terms and conditions are not complied with.